A new musical that features the work of Irving Berlin, Holiday Inn features Jim, a former actor, and Linda, a schoolteacher, who open a farmhouse inn that features performances every holiday. When Linda is lured by a dance position in Hollywood, Jim must try to get her back. Although the musical itself is a new production, it is based off the 1942 film of the same name. The film was the first home of Berlin’s now-famous song, “White Christmas,” which earned itself a film in 1954 and a semi-frequently run musical in 2000. The musical stars several Tony Award nominees, including Bryce Pinkham, Megan Lawrence, and Lee Wilkof and will run at Studio 54. It begins previews on September 1 and opens on October 6. Click here for tickets. Comedian Lewis Black is returning to Broadway for a limited showcase of his stand-up routine, particularly featuring his take on the 2016 election cycle. Black, who previously performed on Broadway before the 2012 election, will be at the Marquis Theatre on September 12, 19, 26, and October 10. Click here for tickets. The Cherry Orchard is a classic play and the final one written by celebrated Russian playwright Anton Chekhov. First performed at the Moscow Art Theatre in 1904, the play tells the story of an aristocratic Russian woman and her family, whose estate is set to be auctioned off to pay the mortgage but is given the opportunity to save it. The play explores some of the social upheaval that was occurring at the time in Russia and in the 40 years previous as former serfs were finding their place as free people. This fall’s production of The Cherry Orchard is running at American Airlines Theatre and features a cast headed up by Diane Lane as Madame Lyubov Andreievna Ranevskaya. It begins previews on September 15 and opens on October 16. Click here for tickets. This classic play from 1928 tells the story of a newspaper reporter and his editor conspiring to hide an escaped prisoner while they attempt to uncover a huge scandal. The play was a Broadway original when it opened at the former Times Square Theater in August 1928, where it ran for 278 performances. Throughout the decades, it has popped up on Broadway three more times, in 1946, 1969, and 1986, and has been covered in television and cinema several times. The new production is particularly star-studded, featuring Nathan Lane, John Slattery, John Goodman, Jefferson Mays, Rosemary Harris, and Sherie Rene Scott. Previews of The Front Page start at Broadhurst Theatre on September 20 and the show opens on October 20. Click here for tickets. This immersive play recounts the adventures of National Geographic photojournalist Loren McIntyre, as he gets lost in the Amazon rainforest and encounters an uncontacted tribe in Brazil’s Javari Valley in the Amazon rainforest, as well as discovers the source of the Amazon River. The play is based off Petru Popescu’s 1991 book “Amazon Beaming,” which he worked on after meeting an interviewing McIntyre. The play has received rave reviews and sold out shows in London, Edinburgh, and on tour in mainland Europe. The Encounter is a little bit different than the typical Broadway production. Attendees are handed a set of headphones, through which they hear the sounds of the Amazon. The show begins previews at John Golden Theatre on September 20 and opens on September 29. The limited engagement closes on January 8, 2017. Click here for tickets. Comedians Nick Kroll and John Mulaney are unleashing their opinionated creations Gil Faizon and George St. Geegland to Broadway. The 70-something characters will be the featured event, bringing the act they created for Comedy Central’s Kroll Show. The show has previews at Lyceum Theatre beginning on September 23 and opens October 10. Click here for tickets. Falsettos tells the story of the complicated relationships between a gay man named Marvin, his wife Trina, his lover Whizzer, and their families and neighbors, as well as the realities of the AIDS crisis. Formed out of two one-act Off-Broadway musicals, March of the Falsettos and Falsettoland, Falsettos was scored by William Finn and scored by Finn and James Lapine. The show originally premiered on Broadway in 1992. The new production stars Stephanie J. Block as Trina, Christian Borle, Andrew Rannells as Whizzer, Anthony Rosenthal as Jason, Tracie Thoms as Charlotte, Brandon Uranowitz as Mendel, and Betsy Wolfe as Cordelia. Falsettos will open for previews at Walter Kerr Theatre on September 29 and officially on October 27. Click here for tickets. A classic play, Les Liasons Dangereuses tells the story of two French ex-lovers who challenge each other to seduce, humiliate, and degrade others, in the goal of being able to boast about their “conquests” to each other. Through the course of the events, the two evolve from partners in a twisted game of one-upmanship to bitter enemies. Based on a novel by Pierre Choderlos de Laclos first printed in 1782, the story was extremely controversial at the time and its purpose has been debated, including speculation of it being a commentary on the state of the aristocracy in pre-Revolutionary France. The play originally ran in London in 1985, starring Alan Rickman and Juliet Stevenson, and then opened on Broadway in 1987, also starring Rickman. Since then the play has been revived on Broadway once in 2008. This year’s production will open for previews at Boothe Theatre on October 8 and officially on October 30. Click here for tickets. The famous Four Seasons are coming to the Lunt-Fontanne Theatre for a limited time, from October 21 to 29. I’m not talking about the musical Jersey Boys, which incidentally will be on Broadway at the Virginia/August Wilson Theatre at the same time, I’m talking about the real deal. Well, you get Frankie Valli, anyway, who is the only original member of the band still performing. The group will perform many of their famous songs, including “Sherry,” “Big Girls Don’t Cry,” “Walk Like A Man,” “Rag Doll” and more. Click here for tickets. This musical stems from the 1990 one-man autobiographical show created by actor Chazz Palminteri. It tells the story of a young man who falls under the charms of local mob boss Sonny and must choose between his father’s values or the allure of organized crime. The play was adapted into a 1993 film by Robert De Niro, and both Palminteri and de Niro starred in it. De Niro will also co-direct the musical. It previously premiered at the Paper Mill Playhouse in February. The Broadway show will begin previews at Longacre Theatre on November 3 and open on December 1. Click here for tickets. In Transit is a musical following the lives of eleven New Yorkers just trying to find their way through lives, hoping to find an easy way to success, but ultimately discovering many stops along the way to it. Featuring an a cappella score, it is set to hold previews beginning November 10 and open on December 11. Click here for tickets. After high school student Connor commits suicide, his parents find a note written by a friend, Evan Hansen. The problem is that Evan was not Connor’s friend and had never even met him. However, seeking to help Connor’s parents in their grief, he lies about knowing Connor, going so far as to write a series of emails to keep up appearances. The musical originally opened at Arena Stage in Washington, D.C. in 2005 to rave reviews. It moved to the Off-Broadway Second Stage Theatre in March. Previews begin on November 14 and its opens on December 4 at Belasco Theatre. Click here for tickets. The traveling magician group is back for a third holiday season, this time at the Lunt-fontanne Theatre. This year’s show will turn back the clock to a time when magicians were immensely popular, and will feature some of the most dangerous illusions ever seen, as well as some never seen before. The limited production will begin on November 25 and run through January 1, 2017. Click here for tickets. Although they are best known for starring in the annual holiday hit Radio City Christmas Spectacular, the Rockettes have been expanding their presence at Radio City Music Hall over the past couple years. This afternoon, the dance troupe is presenting its newest show, the Rockettes New York Spectacular. The show tells the story of a family vacation to New York City where the clan’s son and daughter get separated from their parents and find their way back with help of the Rockettes. Along the way, they encounter some of the best known sites and brought-to-life statues of the city. At its heart, it’s a celebration of the Big Apple with some story and lots of dancing. Along with the Rockettes, the show stars Jenna Ortega of the Disney Channel show Stuck in the Middle and Lilla Crawford from the Broadway show Annie. New York Spectacular is a re-vamp of last year’s Radio City Spring Spectacular. Like the new show, “Spring Spectacular”, which starred Dancing With the Stars multi-winner Derek Hough and Tony winner Laura Benanti, was also a big celebration of New York City’s sites and majesty. This year’s show is essentially covering the same themes, just in a different wrapper. The movement to the summer is to take advantage of increased tourism to the city during the summer months, according to David O’Connor, CEO of The Madison Square Garden Company, which owns Radio City. The Rockettes first tried a spring show in 2014, but cancelled the show before it opened. The Broadway-like effort is relatively new for the Rockettes, who have mostly only performed “Christmas Spectacular” since forming in 1925 as the Missouri Rockets. The group moved to NYC and helped open Radio City Music Hall in 1932. They also performed during the first Wrestlemania in 1985, during halftime of The Big Game in 1988, and in occasional promotional appearances. The production will run through August 7 and has shows on Monday and Wednesday through Sunday. Find Rockettes New York Spectacular tickets here. Who is the Next Hamilton? Hamilton’s success has been staggering to almost unimaginable degrees. Its mark has been large beyond record-breaking sales. It has created a cultural movement that changed national policy, and it stands a chance to break multiple records at the Tony awards this year. The phenomenon has suffered a blow recently, as Lin-Manuel Miranda announced his exit from the show. His last performance will be July 9, and with so much momentum, it’s inevitable that Miranda will be replaced. Here are our top picks for actors who can fill Miranda’s shoes. Let’s start with the obvious. Munoz has already played the role many nights. The understudy for the role of Hamilton this past year, Munoz is primed and ready to take the part. Despite being in Miranda’s shadow, Munoz already has his own take on the character, and he can transition the part smoothly and easily, bringing his creative flavor without jarring the production. Yazbeck has proven himself thoroughly on Broadway, and has been nominated for a Best Actor Tony. He has a huge stage presence, and frankly, he can probably fill any role. He would bring grandeur to Hamilton that would be fun to see. We’re not sure how much experience he has with the rap side of things, but a professional of his caliber can likely learn with little trouble. No, wait, don’t leave yet! Hear us out! 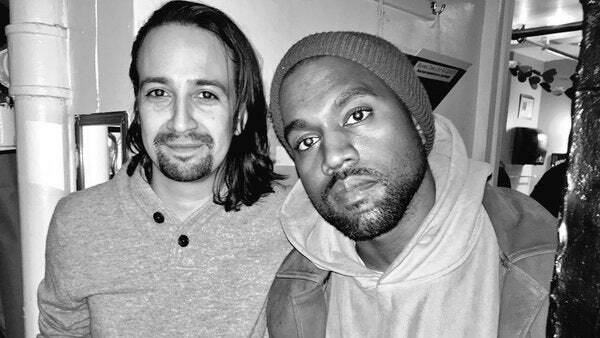 According to Miranda, pictured here with West, the character is actually based on Kanye. There’s no denying that Kanye would make a production out of any performance, and he certainly has the confidence and background to fill a stage. He might need some coaching on the acting side of things, but if nothing else, this would be one of the most fun and entertaining spectacles to ever hit Broadway. Ok, maybe it isn’t the most likely choice, but we stand by it. This option is also less likely, as the Hamilton role is just too big for excessive risks at this point, but it would be an amazing way for a bright new talent to break their way into the scene. It could also free some of the budget restrictions that may lead to other cast members leaving. Regardless, there is always a fresh crop of young, aspiring talent that is ready to take over leading roles. There are plenty of others who might be able to take on the Hamilton role. Who would you like to see? If you want to see who takes the leading role for yourself, be sure to get your Hamilton tickets today! With the introduction of its newest show, the Broadway-located Paramour, Montreal-based Cirque du Soleil now has 39 shows under its belt, and it’s just getting started. Described as following the life of a poet who must choose between love and art, Paramour is not Cirque’s first show in New York City, but it is the first on Broadway. A new touring show, Luzia, also opened this year. At this point, Cirque du Soleil is becoming a bit like a greased wheel, with at least one show coming out yearly. They make it seem easy, but it wasn’t always like that. When co-founder Guy Laliberté and his partners Daniel Gauthier and Gilles Ste-Croix first tried to create a cirque-like show in 1979, Ste-Croix walked 56 miles on stilts in order to convince the Quebec government to provide funding for the show. Even after receiving the money, it was popular but not financially successful at first, though it eventually recouped costs. A few years later, the province gave the partners money to host a show called Le Grand Tour du Cirque du Soleil for Quebec’s 450th anniversary celebration of the discovery of Canada, which was the start of the company’s runaway success. Of the 39 shows that have been created during Cirque’s existence, 17 of them are still running, and one, Soda Cirque is scheduled to open next May. Like any other theater-type show, some of them have lasted longer than others, with Mystère, the resident show of Las Vegas’ Treasure Island, running since 1993. The longest running touring show is Varekai, which has been open since 2002. Most shows explore a theme of some kind, such as nature, social issues, or mythology and tells a story based on these themes. A couple, like Beatles Love, Viva Elvis, and Michael Jackson – One, explore the music and artistry of those performers. Two and a half hours a day of training and exercise, and that’s before performing two shows a night. There are other accounts out there, such as this one artist who works with fire, who explained his situation in a similar way. Don’t miss out on seeing what the three decades of development and training brings to a stage by attending one of the many Cirque du Soleil shows.